So if you used to watch my vlogs every Saturday, you know Matt and I usually do out big grocery shop that day. So this Saturday we went to Walmart, Bulk Barn and Costco and picked up many goodies, including AMAZING new spices to play with. I picked up a few things I don’t normally pick up at Costco since I have been loving cooking up various dishes and trying to make my own recipes. So this week we picked up ground beef for the meat sauce I wanted to make for dinner since we were having guests over. As we all know, Costco usually sells in large quantities so to say the least I had a good 2 lbs of beef left over, so I thought I would attempt to make meatballs for the first time! I just made them up and gave Matt two and his response was “OOHHH MY GOSHHHH… mmmm. PLEASETELLMEYOUMADEMORETHANTWO!!! !” (no spaces since he said it so darn fast ;)). With that kind of reaction I thought it was only fitting to blog the recipe. I have another pound of beef left in the fridge so I may have to make more by the sounds of it! 2. Chop up spinach and onion. Set aside. 3. Mix flour and spices in mixing bowl. Add chopped veggies and beef. 4. Add beaten egg and mix! I ended up just getting in there with my hands as it seemed to be the easiest method :P.
5. Now get in there and start molding those meatballs and place them on an oiled cookie sheet. You can play with the size you prefer, I made a medium size-ish. 6. Bake for 30 – 35 minutes (depending on your oven). Et Voila! 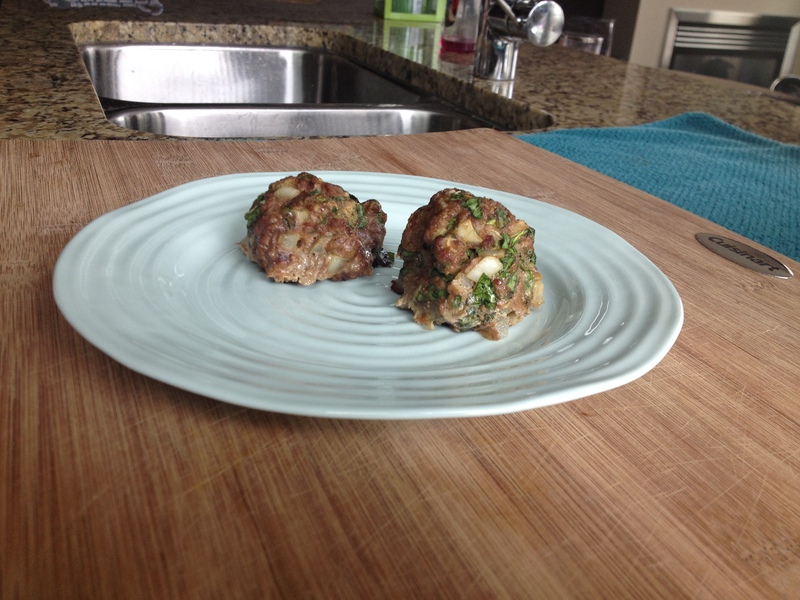 Yummy beef meatballs! 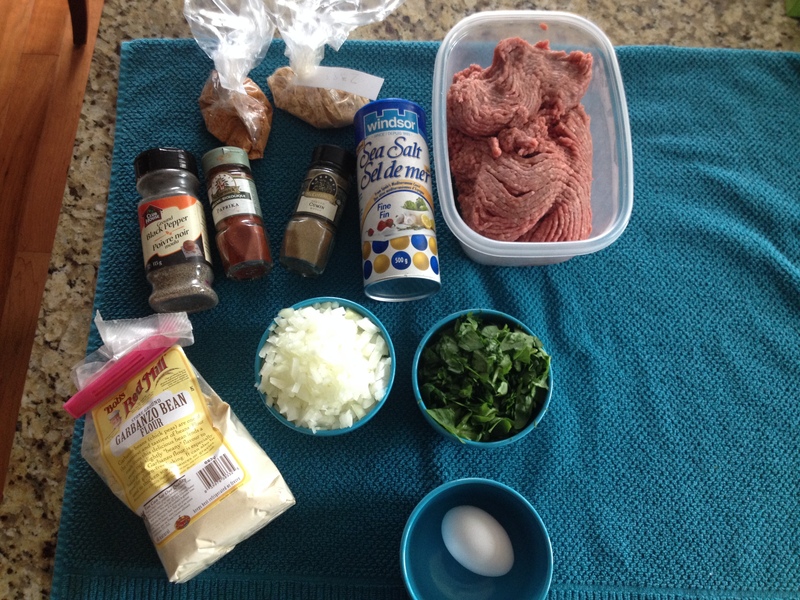 I am going to attempt making Turkey meatballs next. I will keep you all posted on that venture. Now for the Nutritional Information. 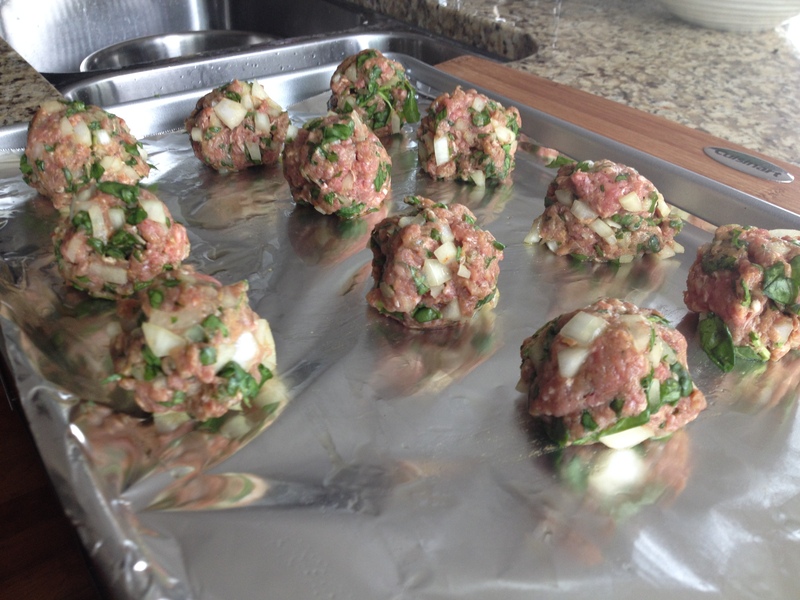 As you can see in the picture of the meatballs raw, I ended up making an odd number! So the information here is for the full batch split into 11! (Weird, I know! Silly Jenn. Should have made 12. Coulda shoulda woulda. Oh well! ).